Worker leaders, lawyers, allies, politicians speak at press conference in Albany, NY on April 4th calling for support of Assembly bill 5501. The bill would make it easier for workers to secure stolen wages. 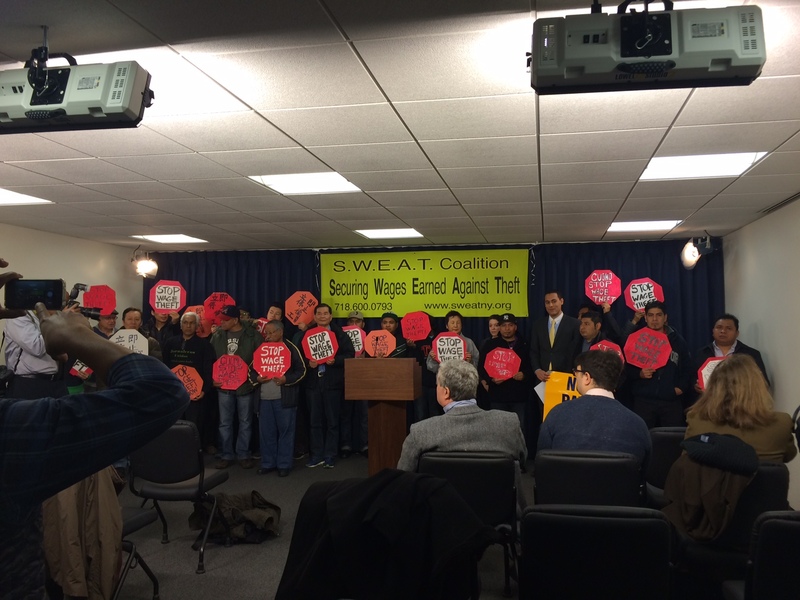 As a member of the SWEAT (Securing Wages Earned Against Theft) Coalition, the Workers’ Center of CNY whole heartedly supports Assembly bill 5501 which would strengthen workers’ ability to actually collect the stolen wages they are owed. Unfortunately, even in New York State, a state with relatively strong wage theft laws, wage theft is still an epidemic throughout the state. Between 2011 and 2014, almost $100 million dollars worth of stolen wages were recovered here in New York State. 1. Expand New York’s mechanics’ lien law to include all workers – Establishes a “wage lien” so that workers can put a hold on employers’ property until their owed wages are paid. The measure would also create an alternative right of action by the DOL or NYS Attorney General to file a wage lien on behalf of claimants who they have determined are owed wages. 2. Hold employers’ assets before they run away – Allows workers to “attach” or hold an employer’s property prior to the resolution of a case that claims unpaid wages. 3. Hold the largest shareholders personally liable for wage theft – Makes it easier for workers of non- publicly traded companies to hold the employers with the largest share of ownership personally liable for wage theft. Unscrupulous employers should not be allowed to get away with stealing wages or hinder workers’ abilities to take care of themselves and their families!